A flawless and youthful complexion becomes a one step process thanks to the newest line from Physicians Formula which offers colour correction + care in one simple step! 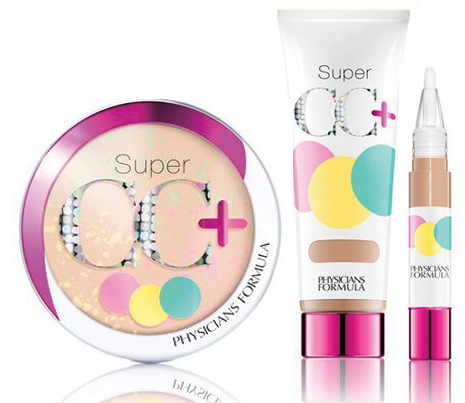 Physicians Formula Super CC+ has all the benefits and multi-tasking ability of a BB and additionally visibly corrects uneven skin tone, imperfections and visible signs of aging with colour-correction technology and anti-aging specialists. Invisible micro colour-correcting pigments and high-tech actives effortlessly deliver a flawless complexion without imperfections. Physicians Formula Super CC+ Powder - $19.99 - in Light/Medium - a lightweight pressed powder that visibly transforms the complexion and instantly corrects the appearance of the most common skin imperfections - age spots, dark circles, blemishes, dullness, uneven skin tone, redness, dark shadows, discolouration, signs of fatigue, fine lines and wrinkles - while protecting skin. Physicians Formula Super CC+ Cream - $18.49 - in Light and Light/Medium - an ultra-blendable and lightweight cream glides on effortlessly to prime, perfect, even out skin tone, conceal imperfections and instantly smooth out the look of fine lines while protecting skin. Instantly corrects, conceals and covers - age spots, dark circles, blemishes, dullness, uneven skin tone, redness, dark shadows, discolouration, signs of fatigue, fine lines and wrinkles - the ultimate multi-tasker that replaces an anti-aging treatment, moisturizer and foundation all in one. Physicians Formula Super CC+ Concealer - $12.99 - in Light/Medium - with a flow-thru brush applicator that glides on to instantly correct the most common imperfections while smoothing skin texture and evening out skin tone. Instantly corrects, conceals and covers - age spots, dark circles, blemishes, dullness, uneven skin tone, redness, dark shadows, discolouration, signs of fatigue, fine lines and wrinkles - that never looks or feels like heavy makeup and can be worn alone or with the Super CC+ Cream and/or Powder to provide a flawless finish. Vitamin C - promotes healthy collagen and hydration levels for a brighter and younger looking complexion.